Asking for a kick in the nuts..
As creatives we are always critical of our own work. However, we have to be realistic and our clients will nearly always know more about their markets than we ever will. So there is an easy way to get to the point... If you want to hear the truth never ask "do you like this?" Most people will not wish to offend and will give an answer like "its OK" or "not bad". If you want to know the REAL truth ask them another question, one which will illicit the truth albeit in a constructive and often more helpful way. It also avoids any brutal feedback that may offend. Simply ask them: "What's wrong with this?" You'll get a much more revealing answer - you may not like what you hear but it will pay off in the long run. If you'd like us to help you get to the truth, then give us a call on 01332 291141 and we will be honest with you about how we can help (or not). Why are we always surprised that Christmas always seems just around the corner? Maybe its because marketers always need to plan well in advance. We have already completed several Xmas projects ranging from diaries, desk planners, cards, and gifts. 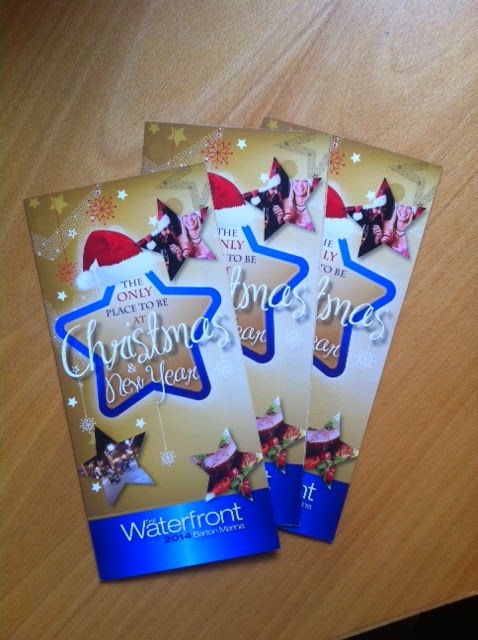 This brochure is to help the Waterfront pub in Barton Under Needwood to promote its seasonal offerings. There will be dedicated web pages and several large format posters promoting them too. Its not too late you get your Christmas orders in yet! Call us now on 01332 291141 to discuss this and your next project - we will be happy to help. You know that sinking feeling you get when something critical fails to work...the car won't start, the key won't turn in the lock, the phone has no signal, the wifi goes down. You know what I mean right? Well, this week our trusty LaCie 500Gb drive failed to boot up. It's been a powerful and reliable workhorse for around 5 years now. Always there and ready to serve up one of over a 100 million pixels - 'old trusty' was her nickname. Sadly on Tuesday "Trusty" coughed her last byte sized rattle, an ex drive if you will. 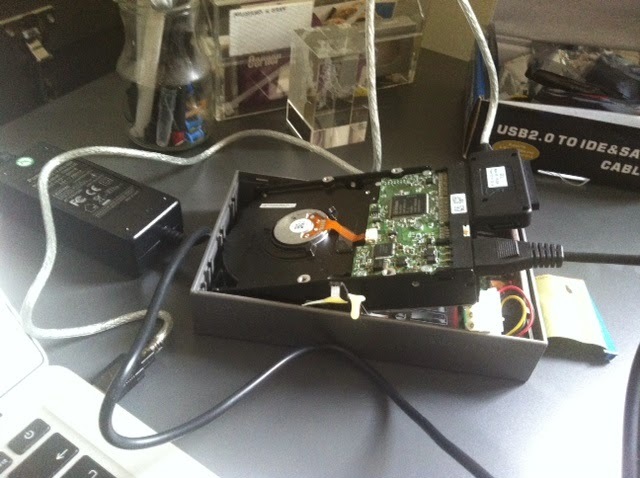 Now I know what you are thinking, just restore all the data from our backups - easy yes? It is certainly possible but would entail hours of time to locate and collate the files. Luckily we had a backup from earlier in the year so no work lost - we restored the critical info within a day. However, there was around 350 image files which we had not backed up. These are easy to restore but would take hours - each being a download from various websites - slow and not much fun. I called my pal Joe who has some nifty kit that could possibly bring Trusty back to life - it was a last resort and one that we didn't hold out much hope for. However, last night I got a text from him saying that the drive had mounted and what did I need to restore? Joy, happiness, elation, relief. All rolled into one! So today, I spent a relaxing morning restoring files and drinking Joe's fine Italian coffee - back to the studio by 11:30 and files all restored by 2:30 - nice one! 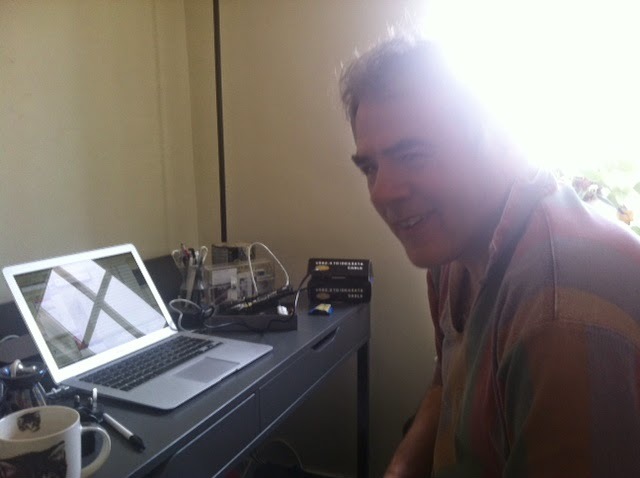 So thanks to Joe and his magic box of tricks - if you want any IT work or programming then Joe is your man - just mail me if you want him to help and I'll pass on his details. Our friends at Open Reality asked us to come up with some large format graphics for their offices. We think these stretch canvas panels work really well - they are simple, clean and very eyecatching. Each panel contains a message about the value that Open Reality brings to its customers. In total there are 21 panels. We are looking forward to seeing them in situ! If your office could do with a makeover then why not give us a call on 01332 29114 and we can have a chat about 'watching dry paint' or watching nice images! Marketing degrees- value for money? As yesterday was results day for thousands of A-level students across the UK, and with me feeling nostalgic about my own results day, I've been thinking about the best degrees or pathways to pursue a career in marketing..
With the typical degree now costing at least £27,000 is it worth taking degrees such as 'Marketing BSC' and potentially narrowing one's career options, or broadening yourself out to subjects such as Business Studies but perhaps gaining less marketing know-how? Personally, I have chosen to do an English BA in order to allow myself some security when I graduate; ideally my degree can open doors to a career in advertising copy-writing or journalism but if not, I believe I will have skills to apply to other sectors as well. This leads me on to another question, is the subject of a degree actually even relevant? As an example, my Dad has a degree in industrial chemistry but has worked in local radio for years. As long as you have a 2:1 in your pocket there are many companies who are less interested in the actual subject you studied. If you have a job in marketing (or had ambitions to have one but took another route) I would be really interested in hearing the path you took to get to where you are today. Let me know your thoughts on the best way to get a foot in the door. Alternatively if you're looking to consult with those who have 'made it' in the marketing world, give the PE team a call on 01332 291141! It is relatively common these days for estate agents to deliver a flyer to 20 houses on either side of a house they have for sale or to let. These flyers are casually known as 20:20 flyers. 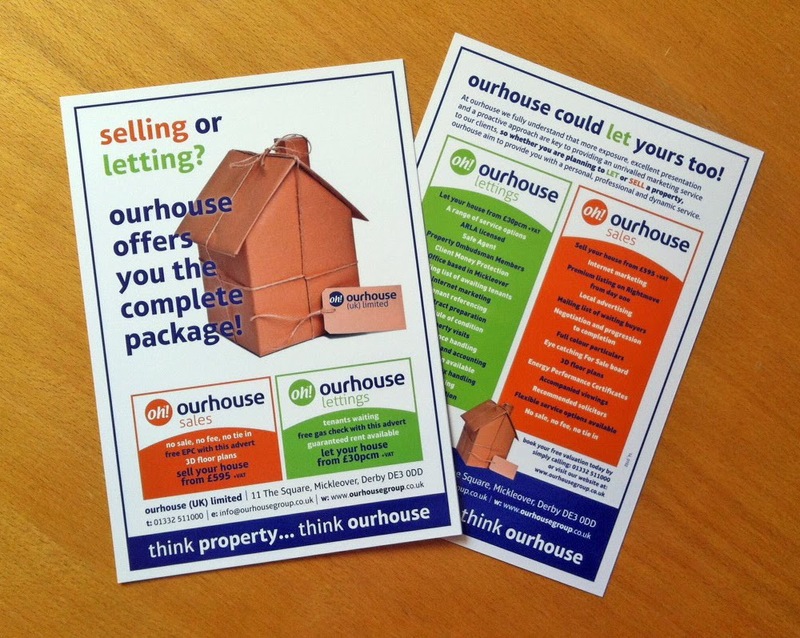 We produced these nifty little A5 gloss laminated cards for the Our House Group. If you receive one through your letterbox you'll know about it because they are pretty heavy - 350gsm with a gloss lamination. This makes them very durable, not to mention tactile. If you shut your eyes and feel it you would not want to throw it away - and this is the whole point! The flyers are just one way that we are helping the new management team at Our House - we have recently updated the For Sale and To Let signage as well as refining their brand ID. If you want to sell more of whatever you make /do / provide or if you simply want to make a better impression, then call us now on 01332 291141 for a chat.